And all this’s possible because of YOU. Yes, you! You make my recipes, you give feedback, you send encouraging e-mails, you ask questions, YOU are here with me on this wonderful journey. And I’m so grateful for that. Truly! So today I want to give back! Giveaway has ended! Big congrats to winners: Angela W., Carol S., and Alexandra R.! And thank you all for participating and supporting Sweet & Savory by Shinee. I’ve gathered 3 fantastic prizes to give away to 3 lucky readers. No doubt, my KitchenAid stand mixer is a work-horse in my kitchen. 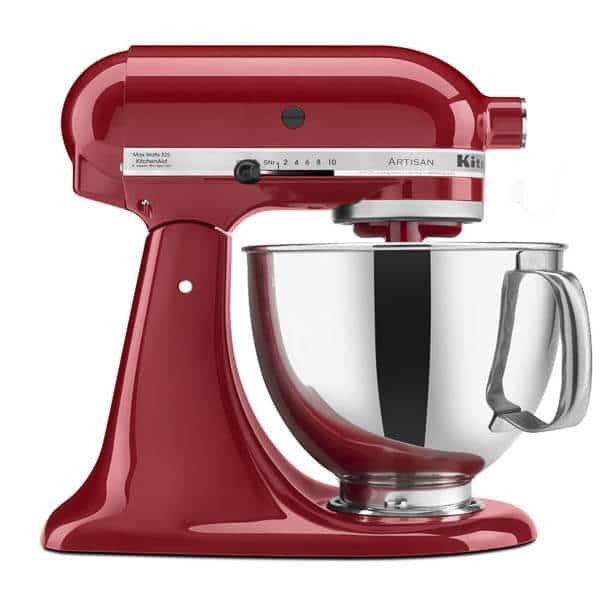 And one lucky winner will receive one Artisan Series 5-Quart Tilt-Head Stand Mixer (color of your choice). Holiday baking is going to be a cinch!! 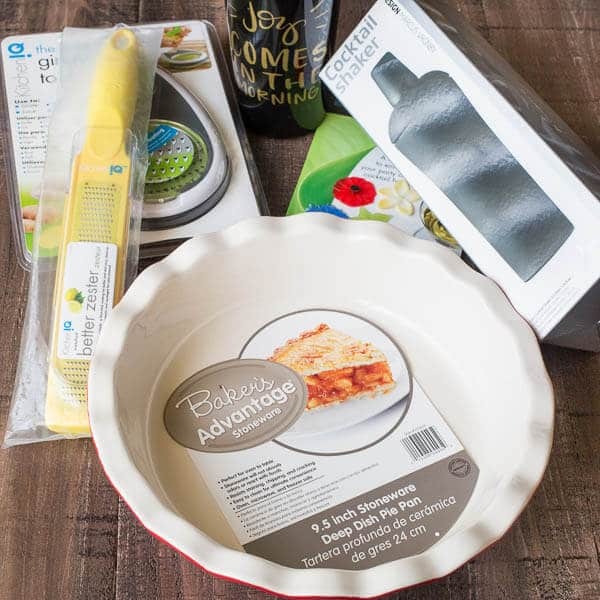 This gift bundle includes all kinds of goodies for baking and entertaining. Some of the items are not pictured. Because it’s a surprise! Login to Rafflecopter giveaway box below via your Facebook or e-mail. Optional entry: Visit my Facebook page. I’d love it if you like my page for fun video recipes and other inspiration. Optional entry: Follow me on Instagram. Winners are Angela W., Carol S., and Alexandra R. Congratulations, ladies! This giveaway is open worldwide. However, the winners from outside the U.S. may receive monetary value due to shipping costs. This giveaway ends on Friday, November 25th, 2016 at 12am MDT. The winners will be chosen randomly via Rafflecopter and notified via e-mail, as well as on this post. This giveaway is sponsored by yours truly. 🙂 Thank you for reading and following along on this journey! I think I would have to say space is my biggest struggle. I have a tiny kitchen and with limited surface area it’s difficult to work and prepare all the dishes, which in turn makes me worry about timing and getting everything done on time. Timing everything so it is all done (and hot!) at the same time! Hmmmm… my biggest struggle is figuring out the cooking schedule! What can be done the night before, what can be baking while I prep something else, what can be cooked in the crockpot…. it’s madness!!! But I love it! I struggle with making sure everything is hot and on the table at the same time! So, I want to officially thank you for this, I’ve learned a lot from you Shinee! My biggest problem is serving the food all warm at the same time! The oven can only handle so much! When we are able to have people over, my biggest struggle is restraining myself from trying a new recipe that I’ve never used before. The untested dish sometimes ends up a disaster! Gotta stick with the tried and true recipes and leave experimenting for in between. just making sure that i have enough time to make everything that I want to! My biggest struggle when cooking/baking for a special occasion is probably picking out the menu. So many great recipes to choose from. My biggest struggle is finding something to please the whole crowd and not spend too much money! Yeah, not an easy task for sure, Keri. I’m a college student so it’s always a struggle trying to find the right balance between wanting to try out fancy, interesting recipes with a bunch of ingredients and trying to keep my wallet happy. Living in a student dorm with limited equipments is also not ideal, can’t wait to graduate! Yeah, dorm is not an ideal place to cook and bake for sure. My biggest struggle is I want my cake or the food perfect as I wanted to be, but sometimes it doesn’t perfect enough for me. Haha Vonny, I could have wrote this. Most of the recipes I look up on the internet and to find the right ingredients in UB and or to find something that could be substituted is my biggest struggle. Yeah, it’s sure not easy not to have all the necessary ingredients on hand. I totally understand. My biggest struggle with baking around the holidays is time management. I need to work on that. Time management is a big one! My biggest struggle with baking or cooking is being a perfectionist. If something isn’t exactly right, I convince myself it isn’t good enough at all. Sometimes okay can be fine!! Totally agree, Megan. I’m a perfectionist too, and I always self-doubt! Sometimes okey is totally fine! My biggest struggle is that I live in a small apartment with a small kitchen, so I have very little space to work and prep time is difficult, but finding where to put the things I’ve coocked is even more chalenging. I would have to say time management. Making sure everything goes in the oven at the right time. I want to have it so the moment my guests arrive ,it’s ready. That’s a tricky task for sure, Laura! Ah, good bread is everything! Mastering Ciabatta is actually on my bucket list. A local eatery has the best sandwich on Ciabatta bread, and it’s my goal to recreate it. Let me know if you find a good Ciabatta recipe. 🙂 And thanks for entering the giveaway, Kent! i think just making sure that i don’t forget an ingredient! My struggle is finding the ingredients in mongolia when i want try new recipes. Oh, I totally know what you mean, Baigalaa! Ah, that’d be frustrating too, Pamela. My biggest struggle is oven space. I wish I had two of them. Double oven is on my wish list too, Sarah. My biggest struggle is that I often don’t allow enough time to prepare a dish and then get to the event on time! That would stress me out big time too, Suzanne. My biggest struggle is time. We have a busy life so cooking and baking for events is sometimes hard to work into the schedule. Yeah, I hear ya, Mary. My biggest struggle is making sure it’s enough for all the guest. I tend to cook in small amounts so I have make sure I can serve everyone. Having only one oven. I sooooo want double ovens in my kitchen. Me too, Lisa, me too! My biggest struggle is fighting for the oven! I want to use it to bake sweets but my family wants to use it to make other things, so I’d either have to wait for a long time or rush through my time so the others can use it. I know what you mean, Belle. That’s why I make desserts the day before. My biggest struggle is making recipes that by mom, who is gluten free can eat while keeping the food delicious for gluten eating folks. Also, it’s a struggle to juggle different oven temps! Accommodating special diets are hard, Habiba. I can only imagine! My biggest trouble is trying to take care of d/h and cook the same time. My biggest struggle is wanting to make way more than I need to! I keep finding more and more recipes that I want to make. Thanks for the chance to win! I absolutely love cooking/baking for my family and friends. My biggest struggle at this time is time management. I have a 2 year old and a newborn, it’s a real struggle because they need soo much attention. Yes, it’s hard to cook and bake with babies!! I have only one and I struggle! My biggest struggle is always coming up with a menu! It is very hard putting together a menu that will please everyone! Pleasing everyone is not easy. I get you, Jenifer. I have a hard time estimating how much food to make. I always make way to much food in fear of running out. Yep, story of life, Jan! Good thing I love leftovers! Time management is my biggest struggle, though I always have a hard time trying to decide what to make, too! So many awesome recipes to try and make. I hear you, Darcy. My biggest struggle is finding something that will be special, beautiful and delicious and that can be made ahead of time (I don’t want to have to put on the finishing touches while my guests are arriving). I love recipes that are clear, concise and that have been tested so that I can have confidence in my outcome. I’m a big fan of make-ahead recipes too, Kathy! My biggest struggle when cooking/baking for a special occasion is…..juggling prepared dishes, to ensure everything is HOT, on the table. Also, making everything and I am the last one to take care of me. I would have loved time to get me ready for the special occasion. Instead, I look like the harried chef…. Not having enough time to cook before the big day. The struggle is real! My biggest struggle is trying to please everyone’s appetite. It is like nobody wants to eat what anyone else wants to eat. Haha just serve cheese. Everyone loves cheese, right? 🙂 Thanks for entering the giveaway, Heather. Oh yeah, I hear ya. That’s my struggle too, Simona! Double oven is on my wish list for my dream kitchen! 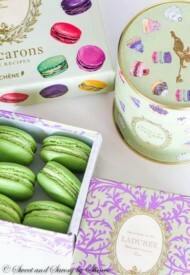 I normally bake macarons for a big event, but you know how time consuming they are. So, time and work space would most likely be my biggest problem when baking for a big event. True. 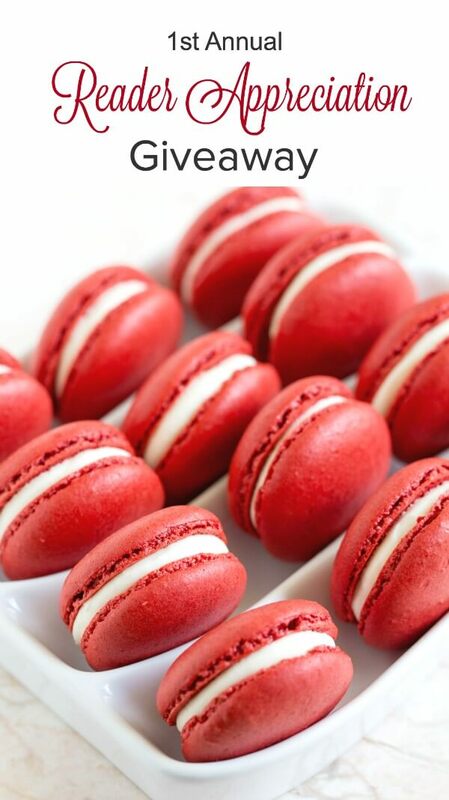 Good thing you can bake them in advance, right? My biggest struggle is trying to please everyones taste palette. Creating a meal the whole family can enjoy yet catering to the needs of their taste buds. It’s more exhausting than it sounds! However, for some unknown holiday reason; I enjoy every second of it 🙂 the baking, the cooking, the aroma of the house right after the apple pie caramelizes in the oven. Yum. 100% agree, holiday cooking/baking is FUN! I love it too. And pleasing everyone’s palette is quite a challenge! My biggest struggle is how to make sure everything is at a good serving temperature. I don’t like to eat cold dishes!! Oh yeah, that’s important point, Christina! My biggest struggle is baking cakes, because for me it is such a neat work, if you miss something the dough won’t raise up. My biggest struggle is that I am perfectionist when it comes to cooking and baking. I am very critical of everything I make and will not serve anything for a gathering unless I feel like I have mastered it. Thank goodness for my boyfriend who is my loyal taste tester! Kudos to taste testers!! And I know what you mean. I feel self-conscious when I serve something new to me. My biggest struggle is making sure I made enough for everyone, we are a small family so I’m not used to cooking/baking for a big crowd, so when I do thats my biggest struggle! Thanks, Olya! And yes, I too always worry if I’ve made enough. I get way competitive with myself lol. I take on everything and if something goes wrong I criticize myself very hard. Ha, I could have wrote this myself, Alexandra. Thanks for sharing! My biggest struggle for cooking and baking for special occasions is room! My kitchen is the size of a large closet basically! It’s a walk through kitchen and one side has my stove, dishwasher and fridge. The other side is my sink and 2 small counter spaces on each side. So, when trying to prepare a meal, sides, desserts and everything for a large family gathering, I have no room! Some how I make it work, but it sure it tough! Thanks, Vicki! Your story reminded me of my college house I used to rent. Practically no counter space and no island. I understand your pain. I have a very small kitchen with hardly any counter space, so because special occasions tend to call for a lot of food, it can be difficult finding the space for things like prep when cooking a lot of stuff at the same time. It’s also hard because if there’s more than one person in the kitchen you’re always bumping into each other, so I end up doing everything alone. Oh, counter space is so important to me too. My dream kitchen is all about counter space!! 🙂 Thanks for sharing, Rebecca. My biggest struggle is finding the time to get it all done. Yep, time is a challenge! 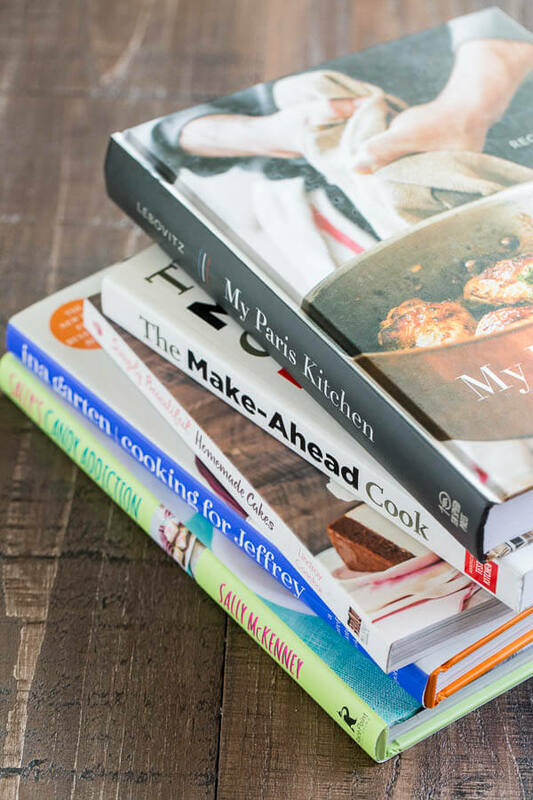 Choosing between so many delicious recipes! Time is my biggest struggle. Mainly because I don’t have the kitchen utensils I need which make it far more time consuming to cook in a timely fashion. Agreed, the right tools really do help to save time. Thanks for participating, Carol!